when and where this person moved? why did he move to a new accommodation? how this person felt about moving to a new house? it depends on different circumstances that sometimes people have to move to a new accommodation.some people moved from village to city for higher facilities or higher education of their children.but some people from one accommodation to another in the same city.today I am going to talk about my uncle who has moved from a village to city.his name is b.s kahlon and he is working as an E.T.O in excise department. he was living in a village for a long time.everything was going well until last year.but this year he wanted to admit his children in a reputed school.but he did not find any school for his children which fulfill his expectations.once when he visited our house he told me about his problem.so I suggested him why not you shifted into moga city because there are a large number of cbse and icse schools.so he decided to move to moga city. he told me to look for a new accommodation which he wanted to buy.one day my friend told me that there is a beautiful house on sale in Dashmesh Nagar area.I saw the house and it was really very beautiful.the important thing was it was near to the bus stand and the market.there was a big garden in front of the house.the owner told me that he has built this house just two years ago but now he got the pr visa of Canada and he is going abroad. so I immediately told my uncle about this.he came here with the whole family and after seeing the house he at once gave some advance to the owner.after few days, my uncle bought the house and he felt very happy for this good deal. 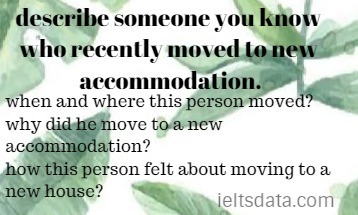 Q-1: what type of accommodation do you like? Ans: I like an accommodation which should be neither too big nor too small.it should be of reasonable size.because a too big house is difficult to manage and a small house is not appropriate for a big family.it should be in a peaceful area that is free from air and noise pollution. Q-2: have you any dream house? Ans: yes definitely I have a dream house.it should be in a hilly area where the weather is very cool.it should have all the facilities.i should have a lawn, a garage, a balcony, ventilated rooms, swimming pool, nice interior, Italian style furniture. Q-3: are you planning to build your dream house? Ans: yes, of course, I am planning to build my dream house.for this, I started saving money every month.I am saving money every month from my earnings.with god’s grace when I collected the required money, I will definitely start building my dream house. As transport and accommodation problems are increasing in many cities, some governments are encouraging businesses to move to rural areas. Do you think the advantages outweigh disadvantages? Pingback: describe something you bought according to an advertisement you saw.